Bubbles’ World of Play are inviting parents and their kids to celebrate their second birthday tomorrow. Staff at the £2.5 million indoor play centre in New Brighton, home to the largest and most innovative indoor play frames in the UK, are also getting ready to welcome their 500,000th visitor. To celebrate their second birthday they are giving away an array of prizes including a birthday party for 12 children, meal deal vouchers, family admission vouchers plus food and drink prizes. There will also be a competition to win a birthday party on Bubbles’ World of Play’s Facebook page. Peter Collard, general manager of Bubbles’ World of Play said: “I can’t believe we are so close to welcoming its 500,000th guest already, it doesn’t seem that long since we started out. 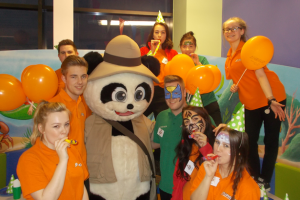 Since Bubbles’ World of Play opened its doors in 2013 to children aged up to 11 and has gone from strength to strength. It has been awarded 5 star food hygiene awards year after year, and has been shortlisted as Attraction of the Year at the Visit Wirral Tourism Awards 2015. The fun starts tomorrow, Friday, March 20 from 9.30am.